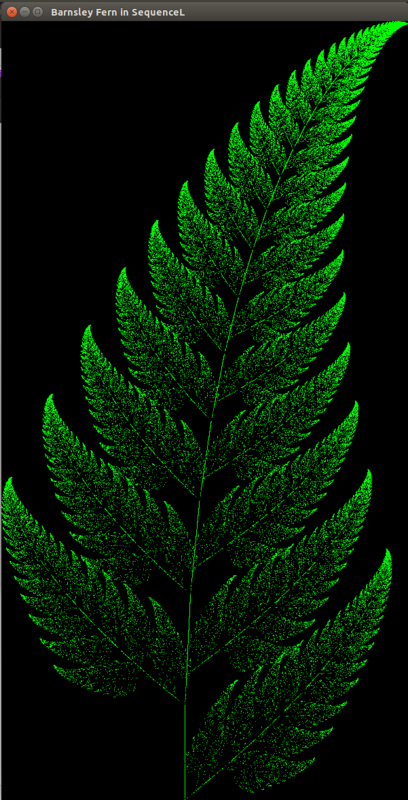 A Barnsley fern is a fractal named after British mathematician Michael Barnsley and can be created using an iterated function system (IFS). yn + 1 = 0.26 xn + 0.24 yn + 0.44. This program generates a PBM file. This implementation requires the WinBGIm library. Iteration starts from (0,0) as required by the task however before plotting the point is translated and scaled as negative co-ordinates are not supported by the graphics window, scaling is necessary as otherwise the fern is tiny even for large iterations ( > 1000000). This code uses the opticl package for generating an image and saving it as a PNG file. Hint: After putting a TPaintBox on the main form align it to alClient. Client width / heigth of the main form should be no less than 640 x 480. Windowtitle "hit any key to end program"
set title ttl font "Arial:Bold,12"
-- Four affine transformations used to produce a Barnsley fern. -- the same number of points in the fern. -- composed of that number of points. ## pBarnsleyFern(fn, n, clr, ttl, psz=600): Plot Barnsley fern fractal. ## psz - picture size. # Creating matrices M1 and M2. contains the X and Y coördinates for a scatter plot that can be visualized with a plotting program. output is generated to an output file: BARNSLEY.DAT which contains the X and Y coördinates of a scatter plot. This version creates a list of points, defining the fern, which are then rescaled and output to an eps file. (string-append "%!PS-Adobe-3.0 EPSF-3.0\n%%BoundingBox: 0 0 "
This version creates a list of points, defining the fern, and shows them on a graphic window which can then be saved to a file via the GUI or the console by the user. Output is viewable in a playground. 20 LET wid = 800 : LET hei = 600 : open window wid, hei : window origin "cb"
wid = 800 : hei = 600 : open window wid, hei : window origin "cb"
It is recommended to run on an emulator that supports running at full speed.